Can I pay with cash on the day of the trip? No, we have to book the seats in advance & therefore we have to have payment before the trip. Can I come to the office of Diana's Travel & pay in cash? Yes, you can, but you have to come in advance of the trip - please see our office hours & location on the home page. How do I pay without coming to the office? After you send us an email with details of where you are staying, number of people, we have responded with all the details of prices etc. When you are ready to book the trip, you let us know you are ready in an email & we send you a Payment Notification through Viva Wallet. Once we receive the payment we send you the e-voucher to your email. Yes, you can but there is a 3% surcharge on top of the prices listed to cover the Paypal charges. So let us know if you wish to pay this way so we can send you the request for payment. Note that we will not issue e-vouchers until we have received payment. Can I reserve seats now & pay later? No, sorry your seats will be confirmed/reserved once payment is processed. Why do you need our mobile phones? That is for emergencies only & if you do not show up for pick up, we will try to contact you. If you will not have a mobile, then we will use your accommodation phone number as the contact. How far in advance do I need to book a trip? You can book from 1 day to 2 weeks prior to the trip you want to do. Except for Santorini- this needs to be booked at least 1 week in advance as there is a limited number of seats on the boats & it does get booked up. Can we bring our luggage on any of the trips & leave them on the coach? No, sorry the coach & organizers will not accept luggage in the hold of the bus. There is a storeroom at the KTEL bus station in Chania for a very small amount will hold luggage until 9pm. I arrive into Chania in the morning & want to join your tour the same day, is this possible? No, you need to be at the pick up points very early in the morning ie Samaria leaves Chania at 06.15- Gramvousa & Elafonissi at 08.15- so it isn't possible to get from the airport or Souda Bay ferry into Chania - to the hotel - check-in & then get to the coach pick up point. You need to be here the night before in order to get on the trip. If I arrive on a cruise ship into Souda Bay & am here for the day, can I join any of the trips? Usually, the cruise ships are here for only a few hours & you either miss the pick up time or the trip finishes much later than you have on Crete. The Hop on Hop Off bus is the only thing you can join that won't be a problem, time wise. Do I have to book a ticket in advance for the Hop on Hop off bus? If you are going to be in Chania town, you can just turn up outside the KTEL bus station or at the Agora (town hall) and purchase it from a representative. How long is the Hop on Hop off trip- without getting off? The whole trip takes approx 90 mins. I am arriving on a Cruise ship into Souda Port, how can I join the Hop on Hop off bus (HOHO)? You need to take the shuttle buses provided from Souda to the Agora (covered market hall), which run every 5-10mins from the time you dock. The price of the shuttle bus service from Souda to Chania town is € 3 round trip or € 1,50 one way. This shuttle bus takes you to the Agora and from here you can buy your HOHO tickets directly from the bus on the day. There is a person selling tickets outside the Agora. If the ship arrives early in the morning, the bus will be at the Agora from 9am & it will usually leave around 09.30 once the bus is full. Note that the HOHO bus does stop at the SYNKA supermarket (traffic lights) near Souda port, so you can get off the HOHO & walk back to the ship. Or you can end your HOHO trip at the Agora & take the shuttle bus back to Souda Port. They are not allowed to pick up from this SYNKA point, just drop off. When is the last bus? The last trip of the day is at 4:40pm from the KTEL bus station. NOTE: Diana's Travel does not own this HOHO bus service nor are they in charge of the organization. You can purchase the tickets on the day of the trip at the pick up point from a sales representative from the HOHO bus. What is the difference between the Samaria Tour & the Express/Late Samaria? The Samaria Tour goes on almost all days whereas the Express/Late bus goes on one or two a week. Why is it called the Express/Late Bus? The Express/Late bus is an hour later than the normal trip. How big is the coach on the Express/Late Trip? It seats 24 people vs the large coach which seats 50. Why is the price different? The price is slightly less than the normal Samaria Trip because you are without a guide on the coach. Can I do the Lazy way with the Express bus? No, you cannot, it is only for walkers doing the long Samaria gorge trip. Can the Express Samaria bus pick up from Akrotiri or Kalives or Georgiopolis? Sorry, no, the express bus only picks up along the main coast road west of Chania. Only the normal Samaria Trip does pick ups from these regions at an extra cost. When does the Samaria gorge open in Spring? The 1st of May is the official opening date each year. Unless there is heavy rain, then there is a delay in it's opening. We know each year at the end of April if the gorge will open or not on the 1st of May. So please understand, if you are interested in doing this trip the first week of May, we cannot tell you until then what will happen as weather predicts the outcome. We usually run the Irini gorge or Imbros gorge the last 2 weeks of April, as an alternative, until the Samaria Gorge officially opens. Is the Samaria gorge trip running in October? Yes, as long as the weather holds out & there isn't torrential rain, the trip will be running up until the 15th of October. Then we go week by week depending on how many people are interested & we won't run it daily then just a few times per week. Do you do pick ups from Rethymon or Heraklion? No, but you can drive to our last pick up point which is just off of the National Highway & be last on the coach in the beginning of the day & first off at the end of the day. Do you do pick ups in Kalives & Almerida? Yes, but on certain days of the week, Mon/Wed/Fri/Sun.There is an extra cost 7,50 Euros per person (adults & children) to be picked up & dropped off from this area. Alternatively you can drive to the last pick up point just off of the National Highway near Chania & join the coach there, to avoid extra charges. Plus it is a later pick up when you drive yourself to the point. If we are staying outside the range of the coach pick ups, to avoid the extra pick up charges, can we drive to a pick up point to do the Samaria Gorge trip? Yes, we have a very convenient pick up point only for Samaria Gorge which is just off the National Highway. So if you are staying East of Chania, you could make your way to the pick up point called "SYNKA Supermarket, Omalos Road (in Vamvakopoulo) (look for this name the pick up points map- It is the red bus symbol outside of Chania on our Pick up points Map). Do you pick up from Akrotiri Peninsula- (ie. Stavros, Kalathas, Tersanas & Kounoupidiana)? Yes, but on certain days of the week, Tues, Thurs & Sat. There is an extra cost of 10 Euros per person to be picked up & dropped off from this area. Or you could drive yourself to Chania & meet the coach at the top of Halidon. (we can provide a map to show you where parking & pick up is). Do we have to follow the guide? No, the guide follows the last people to ensure everyone gets out safely. Can I get something to eat before I start the walk? Yes, there is a place that sells snacks & drinks at the start of the Samaria Gorge & the coach stops at Omalos for you to get a coffee & something to eat (it is simple). We also recommend that you take snacks with you to nibble on as you walk through the gorge and a water bottle. You can fill up enroute from the springs in the gorge. In Agia Roumeli, at the end of the gorge, there are plenty of tavernas to have a proper meal. When will we get back from the trip? Can we join the coach from Rethymon or Heraklion? No, if you are in this area, it is best to just drive yourself to the port of Kissamos & get on the boat directly. The cost of the boat ticket is 27 Euros. Or find an agency in your area & book a trip with them. Yes, and there is an extra cost of 7 Euros per person (adults & children) to be picked up & dropped off from this area. Do we need to bring food & water? You can bring your own lunch, but there is a bar selling food & drinks on the boat & there is a canteen on Balos Beach. NOTE: This trip may be combined with the Elafonissi Trip, if the numbers are low on either trip, then they are a combined trip. This usually applies in early & late season. Yes, the Elafonissi Trip does a pick up from this area with an extra cost of 7 Euros per person (adults & children) to be picked up & dropped off. The Elafonissi Express Bus does not pick up from this area. How long are we stay on the beach with the Elafonissi Trip? About 3 hours from 11am until 3pm. If you take the Elafonissi Express bus you will be on the beach from 10am until 4pm. Where can we get something to eat? There are canteens on the beach & on the return you will stop in a village & you can get something there too. You will be in Chania approx 6-6.30pm on the Elafonissi Trip with guide. The Elafonissi Express bus gets you back for 5-5:30pm. What is the difference between the Elafonissi Express Bus & the other Elafonissi Beach Trip? The Express bus has a limited 'area' of pick ups and gets you to the beach without any sightseeing stops. More time on the beach. The other trip has a guide and it is a sightseeing trip as well as spending some hours on the beach. You get to see & understand a little bit more of the Cretan way of life on the guided trip. NOTE: In early & late season, when participant numbers are low, the organizers may combine this trip with the Gramvousa/Balos Trip. So you may have a stop at the Kissmamos harbour on both ends of the trip (Express or no Express). Do I need my passports on the day of the trip? Yes, you need to bring your passports when boarding the boat. You need to provide us the names as per the passports & you will be issued 'boat tickets' on the day of the trip. Can I take the boat just one way to Santorini? Yes, you can take just the one way, but you need to inform us when booking, so we are not looking for you at the end of the day. There is no discount for the one way journey. What time do we return? 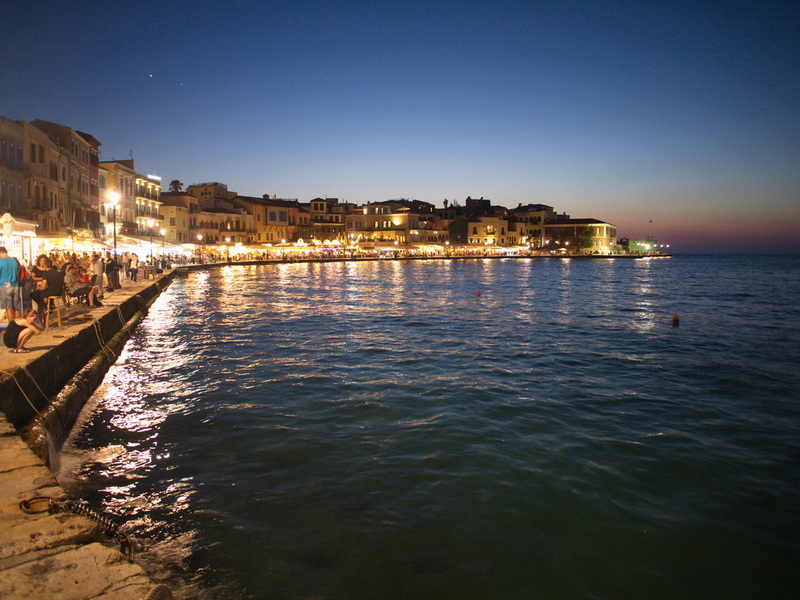 You will be back in the Chania region around 9.30-10pm! It's a very long day. Special Note for Santorini participants: Diana's Travel is a booking agent & you are travelling on a coach which is organized by IO Tours (just the transfer) & when you are on the island of Santorini, you will be dispatched to the various coaches depending on your language you choose to be listening to. These coaches are organized by the Seajet organization & we do not have control over who is the guide. You just need to get on the particular coach for your language & follow that guide throughout the trip, until you are returned to the boat to leave for Rethymon. Once in Rethymon, you will need to get onto the IO Tours Coach to return to Chania. ​All Rights Reserved. No part of this website may be reproduced without Diana’s Travel’s expressed consent.